A survey of recently founded artist-run art academies and education programmes, with contributions from: The Silent University, The School of Global Art, The External Program, MASS Alexandria, SOMA and Islington Mill Art Academy. What would an art school fit for the 21st century look like? It’s become common to note that the last decade has seen a rise in pedagogic projects initiated by artists and curators. As Claire Bishop, among others, has argued, the cancellation in 2006 of Manifesta 6 – a failed attempt to set up an art school in Cyprus, and its afterlife as a series of seminars in Berlin – could be seen as the moment when this so-called educational turn became more pronounced. In the intervening years, countless self-organized night schools, free-to-attend lecture programmes and artist-run art academies have sprung up around the world. The reasons for this, though complex and interrelated, are frequently attributed to escalating tuition fees, cuts to university budgets, the creeping neoliberalization of education at large, frustration with overstretched tutors or inadequate teaching, not to mention a lack of academies in a given region. There are, of course, important precedents for such projects, not least the activities of artists including Joseph Beuys, Luis Camnitzer, Lygia Clark and Tim Rollins, all of whom made pedagogy a central part of their work. This past decade, artist-led projects have taken forms as various as Khaled Hourani and Tina Sherwell’s International Academy of Art Palestine in Ramallah (2005–ongoing), Henriette Heise and Jakob Jakobsen’s Copenhagen Free University (2001–07) and Tania Bruguera’s Cátedra Arte de Conducta (Behaviour Art School, 2002–09) in Havana. In a more established art centre, like Los Angeles, a constellation of initiatives has emerged, such as Machine Project (2003–ongoing), Fritz Haeg’s ‘Sundown Salons’ (2001–06), and Piero Golia and Eric Wesley’s The Mountain School of Arts (2005–ongoing). Other schools are roving (like Pablo Helguera’s School of Panamerican Unrest, 2003–ongoing), studio-bound (such as Lia Perjovschi’s Centre for Art Analysis, in Bucharest) or, like Parallel School of Art or Gerald Raunig’s European Institute for Progressive Cultural Policies, exclusively online. As is clear from the names, one common thread is the claiming of institutional status (Gregory Sholette has used the terms ‘mockstitutions’ and ‘phantom establishments’), even though they remain, for the most part, unaffiliated with any traditional institution. What’s obvious is that many are eager for an art school today to be self-determined, flexible, small-scale and cheap or free to attend. This summer, the tendency found a temporary institutional home at London’s Hayward Gallery with ‘Wide Open School’, a month-long ‘experiment in public learning’ involving more than 100 artists. I invited representatives from three artist-led education programmes, each of which was or will be launched this year, to contribute case studies about their projects: Los Angeles-based Sean Dockray, co-founder of The Public School and Telic Arts Exchange, discusses the background for The External Program, an online learning network based on a Victorian correspondence course; the Turkish artist Ahmet Öğüt introduces The Silent University, a multi-lingual, nomadic institution organized by asylum seekers and political refugees; and the London-based artist collective LuckyPDF interview students from their School of Global Art, a ‘peer-2-peer meshwork’ of learning, about debt and intellectual property. 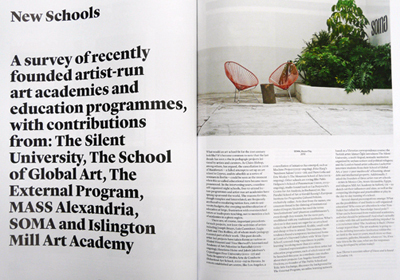 Additionally, I asked the founders of three artist-run art schools – SOMA in Mexico City, mass Alexandria, Egypt, and Islington Mill Art Academy in Salford, UK – to sketch out their influences and aims, as well as the competing ideologies and practicalities at play in the day-to-day running of a school. Several shared preoccupations emerge: What are the possibilities of and limits to self-organized education? Who owns art education in what Tom Holert has called the ‘knowledge-based polis’? What can be borrowed from traditional academies, and what should be jettisoned? And what’s actually at stake with this self-institutionalizing impulse? In a 2009 lecture titled ‘The Academy is Back’, Dieter Lesage argued that: ‘The art academy is going to be the defining innovative institution within the art field in the next 20 years, much more so than museums, galleries, biennials, whatever.’ So, if we take this to be the case, what are the responses being developed by artists today? Islington Mill Art Academy – in Salford, UK – is a free, self-organized art school that was founded by Lusy Bernard, Andrew Beswick, Maurice Carlin and Louie Lister in 2007. What is the background to Islington Mill Art Academy? Maurice Carlin & Lauren Velvick We met in 2007 whilst on an art foundation course at Stockport College, near Manchester, at the time all of us were talking about the different universities and courses we might move on to. Tuition fees of £3,000 per annum had just been introduced in the UK. After attending various university open days, we were uninspired by the prospect of spending our time and money at any of them. So four of us decided to create our own framework for becoming artists, drawing on what resources we could muster. ST Do you have any specific historical models or influences? MC & LV We were aware of well-known schools, such as the Bauhaus and Black Mountain College, but they seemed distant. As we were at the beginning of our art education, we didn’t yet have the experience that an education might bring – to draw on, respond to or battle against. But we did have the sense that art school need not be onerous, that it could be something that any group of willing and energetic people could create for themselves. ST How are you funded? MC & LV We are self-funded – each person supports themselves through paying for a studio space (if they want or need one) and contributing to research trips and residencies. We have invaluable support from individual artists and organizations. Many people have become involved on the basis of taking part in a mutual exchange of learning. ST Is your initiative a specific response to something? MC & LV Universities can present too-narrow a definition of what it might mean to be an artist in the world; students are set up to fail, partly because of this. We realized that many artists don’t get the skills or awareness needed to function and survive in the real world from their education. Graduation is presented to them as a crucial benchmark in becoming an artist, but we’ve come to believe that it’s the beginning of something rather than an endpoint – the process of ‘becoming’ an artist is an unending one. ST Do you address a specific local community?Is there a national or international component? MC & LV The Art Academy is based at Islington Mill, in an area of Salford that is currently undergoing significant regeneration, and some of our artists have worked with individuals and communities in the area. We have also forged links with other experimental art schools throughout the UK – including the Glasgow Open School, The Free University of Liverpool and Department 21, which is based at the Royal College of Art in London – and have set up artist exchanges with arts organizations in Berlin and Barcelona. ST Do you award a qualification of any kind? MC & LV No, though we have had a ‘graduation’ party where we awarded our own qualification (which is called an n/a) for skills, experience and qualities not formally recognized by academia. People graduate or move on when they feel ready to; some leave formally whilst others drift into new areas of practice, sometimes returning further down the line.